On the top floor of the Omni Hotel in front of a full audience of programmers, recruiters, family and friends, 30 blue-shirted students presented their transformations from amateurs to skilled software developers. The event, dubbed “Career Day” by host, MakerSquare, was the final exam of an intensive 10-week developer bootcamp designed to turn hopefuls with little-to-no experience into professionals. 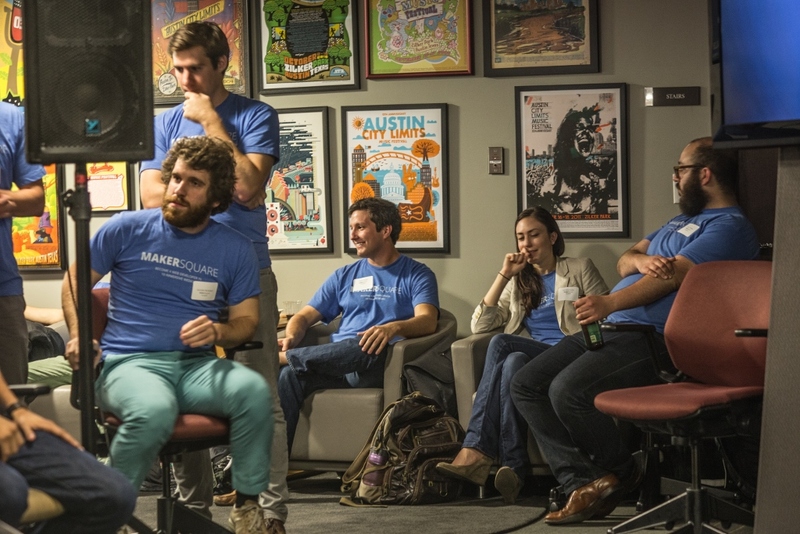 Less than a year old, MakerSquare is part of a growing national trend of fast-paced, rigorous web and software development “schools,” and in just a short time has gotten a foothold in the Austin tech community. MakerSquare began in February, the brainchild of two University of Texas at Austin graduates and two transplants from Chicago and New York. It has since grown to seven full-time and three part time employees, not including the co-founders, and is planning on adding five more staff members in the next month. The company held its first class in June and has already announced classes for next February and April. The next class, starting at the end of November, is completely filled at 40 students. With these growth rates, Techzette estimates Makersquare will pull in over $1 million in revenue during its first 12 months of operation. 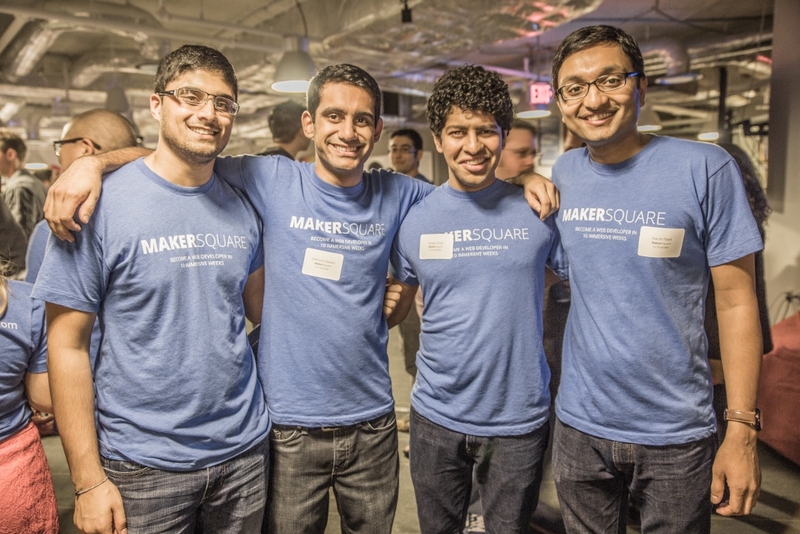 The average MakerSquare student, according to Shah, is a college graduate and has been in the workforce for four to five years with a background in finance or marketing. Fifty six of 58 students in the first two classes graduated from the bootcamp, and half of the first class—14 students that asked for help finding a job—are now working as software developers. Silas Rioux was one of the first applicants interviewed for the June class, and after graduating, found a job with Austin startup Bypass Mobile. “I felt like I learned more in those 10 weeks than I learned in my entire four years of college,” Rioux, who has a degree in economics, said. BootCamper, a website that compiles information on nationwide coding bootcamps, lists 44 schools in its database, everywhere from Akron, Ohio to Australia. Bootcamps have become so popular amongst budding developers because they offer a quick, relatively cheap entry into the profession, and are a viable alternative to college or graduate school. 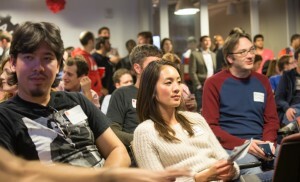 Every MakerSquare class begins with an application and interview process. Finding qualified applicants has been a challenge, according to Shah, but as word of the bootcamp spreads and its graduates disseminate into the workforce, they have been increasingly able to find better candidates—and, as a result, been more selective. MakerSquare’s acceptance rate is now at 18 percent. Selected applicants complete one to two months of work before the program even begins, then, once in Austin, undergo a rigorous 10-week course, comprised of lectures, pair programming and group projects. Thursday night’s event was the second opportunity of the course for students to display their work to the community. Because of how time-intensive the bootcamp is, MakerSquare students are now prohibited from working at a job during the 10-week course. With a hefty price tag, now $11,600 a student, the cost can pose a problem. 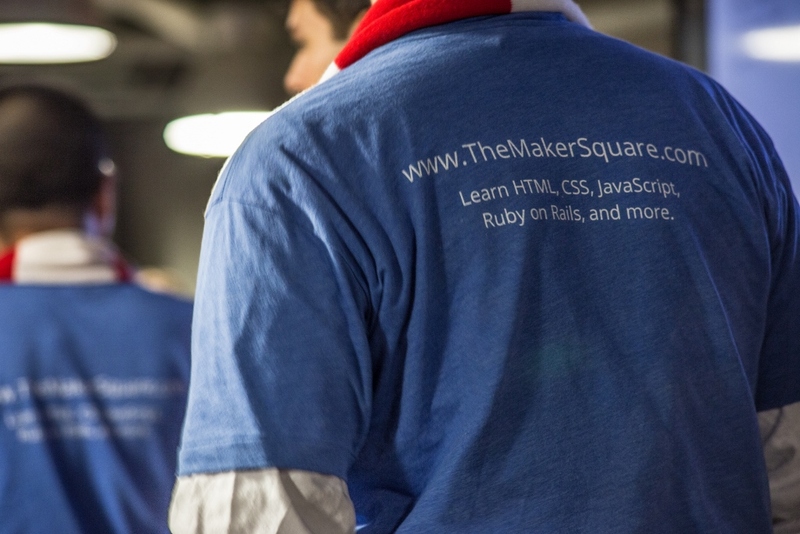 Click to see the Makersquare career day Photos. Career Day began with short presentations from groups, each made up of two to three students, followed by tabling and networking. Students got a chance to speak one-on-one with recruiters, many of which were from local startups looking for developers. “We’re trying to find talent wherever we can get it. MakerSquare’s an incubator for this, right? So, it sounds like, based on the presentations and what we’ve heard when we’ve been talking to people, these are the kind of people that we’d want to hire,” Mike Kessenich, Vice President of ValencePM, a Houston property management software company, said at the event. Projects included a musician collaboration platform called Headband, Sporticulture, an international forum for soccer fans, and Prepify, a free online SAT prep course for low-income students. Prepify is a part of what Shah proudly referred to as “coding for a cause,” using web development skills to give back to the community. “If the next big thing is learning Excel, and that’s the most exciting thing and that’s providing good careers and allowing people to find fulfilling careers, that might be something we teach. But coding, right now, is the avenue that we’re on,” Shah said. Though MakerSquare is in talks with Visa, it has seen a lot of reluctance from major companies not open to hiring developers from nontraditional backgrounds and just a few months of experience. “A lot of people are like, ‘Why would I hire from this bootcamp? It’s [hiring] someone with three months of experience to be a developer’,” Shah said. “After hiring them, they realize that they didn’t just hire someone that was a junior developer. Recruiters at Career Day, however, said they had no qualms about hiring a developer from a nontraditional background, and in some cases even preferred it. Because of high front-end costs and the price of building a curriculum from the ground up, MakerSquare has yet to turn a profit, though it has been financially stable on a month to month basis according to Shah. Plans for a Dallas campus—to open in February—have been finalized, though the future of MakerSquare is fluid. “We have built this pretty comprehensive curriculum that other cities in this country could use. I don’t know if we care to go to every city in the country…but I could see myself going to certain cities, where there’s a good community and a good entrepreneurial spirit, that we could teach more people how to code and help their economy,” Shah said.